US, 1956, 114 minutes, Colour. Jeff Chandler, George Nader, Julie Adams, Lex Barker, Keith Andes, Richard Boone, Frank Faylen. 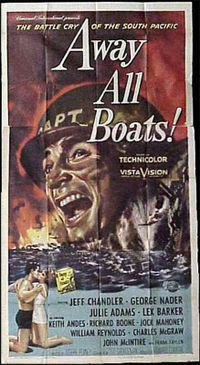 Away All Boats is one of those World War Two tributes from the '50s. This time the setting is the American Pacific and the atmosphere is well re-created. Jeff Chandler handles the central heroics very well. Quite interesting and enjoyable even now. 1. A good war film? The 1950s view of the war? A tribute? Presenting the war realistically? 2. The technical achievement, colour, techniques, war sequences? 3. The focus on the Belinda, the building sequences? Audience involvement with the ship and its way of life? The ship during the war and its role? At the end and its being saved? Its work in the fleet., in the Pacific? 4. The personality of Hawkes and his arrival, his style., confidence? Driving the men, living alone, toughness, illness? Loneliness? 5. The contrast with McDougall? and his maritime background, wife and the flashbacks reading the letters, a human touch? Appropriate for the film? His support of Hawkes, final heroism and takeover? 6. The variety of men and their personalities: Quigley and his theory and people's opposition., his getting his ship? The doctors, the skilled Hen around the place? Kruger and his mission? 7. The importance of so many training sequences, men's limitations and inadequacies, the failure? A sense of realism to the war film? 8. Involvement in the war, sufferings and casualties? The missions e.g. the rescue at night? The importance of the battle sequences and the destruction wrought? 9. The picture of pressures and tensions on the men, the signals man and his petty attitudes, the fight on the beach? Waiting for letters? The psychology of building the sailing boat to vent anger? 10. The portrayal of command and leadership? The psychology of command? Hawkes and his skills and dedication? His relationship with men, understanding them, driving them, making them better than they thought they could be? 11. The final destruction, Hawkes' injuries, the moment of death and seeing his ship safe? McDougall's heroism and the devices the men used to save the ship? 12. The war achievement? In retrospect? How realistic and a good portrayal of men in war? Americans at war?